OMG! Stop the presses! A bronze index finger in the Louvre, which was initially believed to be a toe, has been revealed to be the index finger of a colossal bronze statue of Emperor Constantine in the Musei Capitolini in Rome. 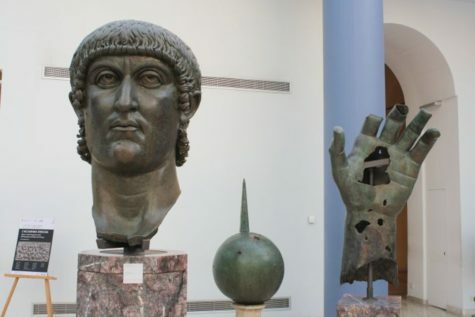 Fragments of the 12m-high, early fourth-century bronze statue of Emperor Constantine are among the most valuable bronzes in the Capitolini’s collection. They include a huge head, a sphere, a left forearm and hand, which is missing the palm (that held the sphere), part of its middle finger and most of its index finger. Twelfth-century archives also mention a huge crown that is lost.